This forest map shows connections between a large Mother tree and younger, smaller trees... which in turn are connected to others and to each other. 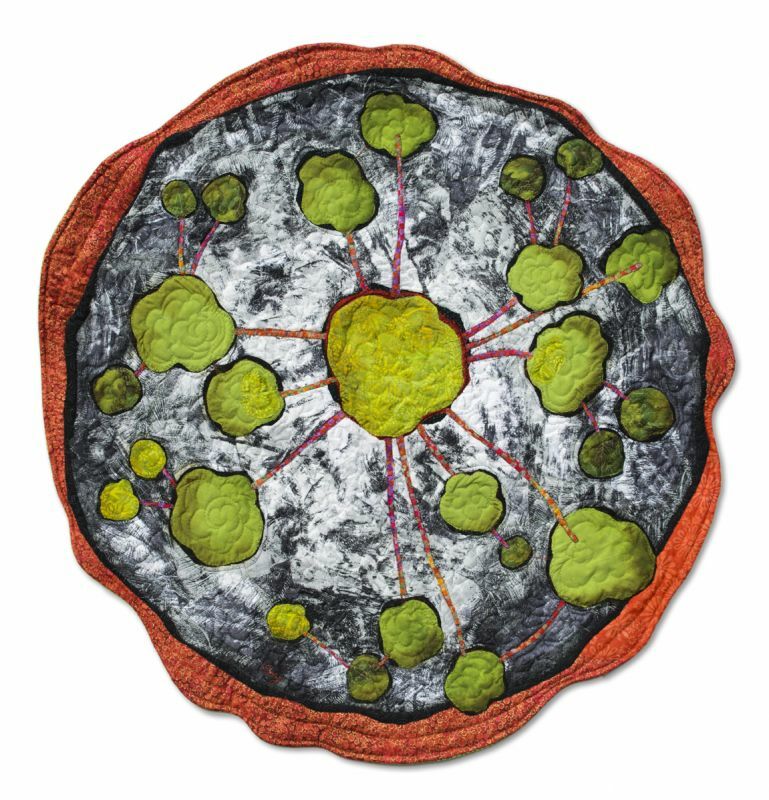 This piece was inspired by a research map which traced mycorrhizal connections in a 30 x 30 m plot of Douglas Fir. Larger trees were found to be much more connected, and one of them was directly traced to 47 other trees. These mutual connections help stabilize the forest’s ecosystem. Fungi form a bridge from one set of roots to another, not unlike the synapses between nerve cells. The stringy white hyphae of the fungi act like fiber optic cables, transmitting messages and nutrients along pathways between trees of same or different species. The rhizosphere crackles with chatter. The effect of the resulting stable environment radiates to all living creatures within its boundaries. Everything is connected. Read more about the beginnings of my journey with this project HERE. "If I were an alien from outer space I would see the map of this forest as a single live fabric...The forest grows like a complex membrane at the interface of solid rock and gaseous atmosphere, drawing from and contributing to both. Only when one gets close to it, armed with a field guide, perhaps, can one pick out each biological stitch and give it a name, a spurious separateness, which - in its intricately threaded life - it doesn't have and never has had. The fabric can be revealed, worn, made dull... We can crush, snip, and wear it away."